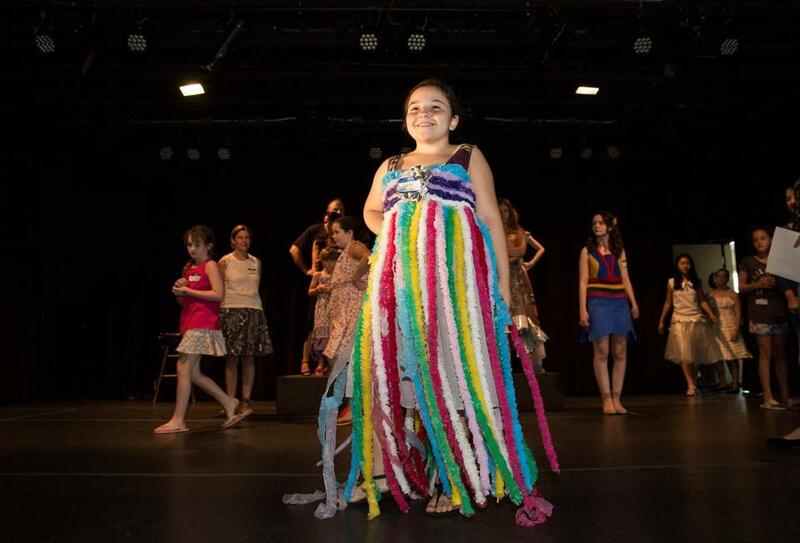 Gabriella Winston, 10, wearing a dress that she helped to male out of plastic leis. There’s nothing especially thrilling about a single Macy’s shopping bag: just a big red star against a plain white background. But when a designer transforms dozens of those plastic bags into a belted ruffle dress — now that is eye-catching. At Rubbish to Runway, the materials on display may be someone else’s trash. Taken on its own, bubble wrap isn’t fashionable. Neither are plastic bread clips, or the numbered bibs left over from a road race. Made into wearable art, however, the results are undoubtedly treasures. This unusual fashion show, set to take place at the Blue Ocean Music Hall in Salisbury on Oct. 14, is an annual local fund-raising event. Now in its seventh year, Rubbish to Runway supports an Oregon-based nonprofit called Long Way Home, which does innovative community development work in Guatemala. The idea behind the runway show has now spread to sister events in Houston, Los Angeles, and Edmonton in Alberta, Canada. The show is the brainchild of Elizabeth Rose, a former program director at MassRecycle who happened upon the work of Long Way Home on a family trip to Guatemala in 2005. She and her husband, Joe Hull, an emergency-room doctor who is now retired, and their two children, teenagers at the time, were there to teach English. Over the years the financial goal has remained the same, but the show has gotten bigger and better each year, said Rose, who now serves on Long Way Home’s board of directors. “The artists say every year the bar goes up, as they see what their cohorts made,” she said on a recent Monday evening at her home. Working with photocopied pictures of this year’s dresses, she and volunteer curator Paula Estey discussed the flow of this year’s show, which will feature amateur models of all ages. “Let’s put the three cutie-pies right before the finale,” said Estey, who owns a Newburyport gallery. A few days later, many of the dressmakers and their models convened for their first rehearsal at the Music Hall. Becca Donohue, a 25-year-old preschool teacher who lives in Hamilton, said that she and her mother, a children’s art teacher, have contributed pieces to Rubbish to Runway almost from the beginning. While some designers do sell their pieces, the majority want to keep them. Any kind of auction, Rose believes, could distract from the egalitarian nature of the show. Instead, proceeds are raised through ticket sales and, beginning this year, through sponsorships. Local businesses can now pledge a flat fee and access to their own recyclable waste in exchange for promotional opportunities and, eventually, ownership of the pieces they supported. For the past several years Nancy Langmeyer has helped Rose coordinate the event. Long Way Home, she said, “is constructing schools out of these things that we discard every day, and they’re getting the community involved. And the fashion show kind of echoes that. At the rehearsal, Donohue introduced a visitor to sisters Rebecca and Gabby Winston, 12 and 10 respectively, who were wearing dresses that Donohue helped them make. Rebecca’s was made from the folded pages of a “Star Wars” novel. With a wink, Donohue explained that Gabby had requested “lots of color” in her outfit. Unlike some industry runway shows, this one is full of enthusiasm. Models walk the runway to a wide variety of brash music, from Sinatra to heavy metal. The amateur models are coached by Diane Gage, a longtime runway trainer who lives in Rowley. Once they become involved, they’re hooked on recycled fashion. Rubbish to Runway: 6 p.m. Oct. 14, at Blue Ocean Music Hall, 4 Ocean Front North, Salisbury. Tickets $25-$70. www.rubbishtorunway.org.